Celebrate Holi Fest (Festival of colors) with exclusive cuisines, desserts & drinks of different regions. The Recipes at Bravura Gold Resort invites you to celebrate Holi Fest (Festival of Colors) with exclusive cuisine, desserts & drinks of different regions on 6th Mar, 2015. Enjoy Dinner Buffet at Just Rs. 699/* (Per Person) and Stay for one night at Just Rs. 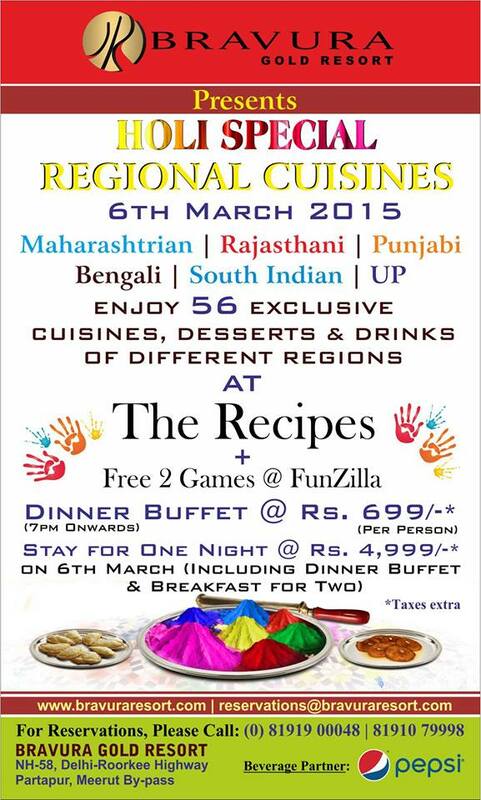 4999/-* (Including Dinner Buffet and Breakfast for per couple) + Free 2 Games at Funzila. So Come and enjoy this Holi with us.